Good with Children: Sienna has no small children in her foster home, but has had exposure with the small neighbor kids that are 2,4 and 8 yrs old. She enjoys playing with them. Good with Dogs: Yes. Sienna is in a house with three other dogs. Biggest one being 95lbs and the smallest 45lbs. They play very well together. She is a typical puppy so older or less friendly dogs might find her annoying. Good with Cats: Unknown. 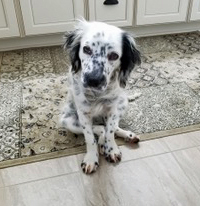 There are no cats in Sienna’s foster home, but she is a young puppy and could probably learn to live comfortably with cats. She is very mouthy with her foster dogs and they tolerate her, so the cat would have to be ok with her being very courious about them. House trained: Yes! She does well if she is taken out frequently and she is learning quickly to go to the door and nose a jingle bell strip! She had a few accidents when she first arrived, but is a quick learner. She does keep her crate clean and does not mess in there at all. Crate trained: Yes. Sienna will go into the crate when we say “kennel”. She will fuss for a few seconds, but settles down pretty quickly and does well through the night. Leash trained: Getting there. Sienna loves to go on long walks and a harness leash works best. She enjoys walks with her other fur foster sister and walks right beside her. Activity Level: Average. Sienna likes to play in our back yard and her ES sister runs her all over our back yard. She is pretty laid back in the house and always gets a favorite chew toy and will lay on her pillow for quite a while by herself. Fence: Preferred. A fenced yard is always preferred. The first day she was here, she was able to slip through the fence rails. She is a tiny little girl and needs to be watched outside. 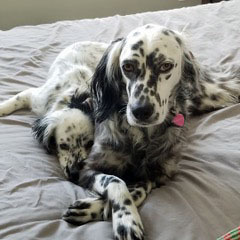 Training/Behavior: Sienna has been with her foster for three weeks at the time of posting, and, like any puppy, she would benefit from an obedience training. She is a very quick leaner and will need someone that can be constant. She still chews on things, but she is easily redirected with an appropriate toy. She is not a biter, but if she sees toes, she will try to nibble on them! 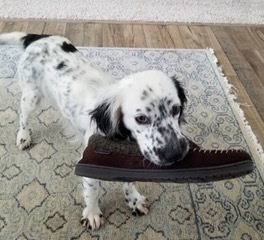 She will pick up anything to chew on.Her new family will need to work with her on this. She is a smart puppy and learns quickly. Overall, she is friendly and loves everyone (dog and human). She is a very happy and social puppy. She is the little diva at our house! 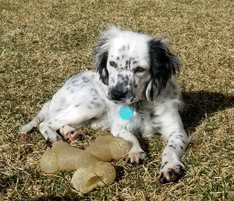 Medical History: Sienna is a healthy pup and up to date on all her vaccines. 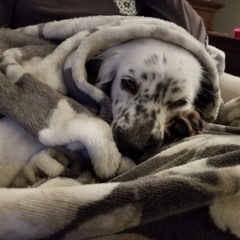 She was set to be spayed this week and went into heat. It will be a few weeks before we can have the spay done, so depending on the adoption time frame, new owners may have to have it done. Sienna is from Greece where Leishmaniasis is endemic and an annual blood test for leishmaniasis as the parasite can remain dormant in the system. Potential adopters must be willing to commit to annual testing for the next 7 years. Your vet can draw the blood and send it to the lab. The test typically costs $120-150 but varies from vet to vet. Sienna was found in northern Greece abandoned. She quickly became the favorite of the shelter and we can see why! She is a sweet, lovable, tiny girl. I’m not sure if this is a proper name, but I have heard her smallness phrased as a “pocket setter”. She is defiantly a people person. She has to be everywhere with people. She will sleep all night if we make her, but is just as happy to sleep right beside you in your bed! We have left her for up to 5 hrs in her crate during the day and she had no problems. She would probably do best in a house with other pets or kids. She loves attention and is very playful.